Since I only dabble a little bit, and not very often, in Mixed Media, I thought it would be fun to sign up for the Color Theory class at Studio Calico, taught by Wilna Furstenberg. The first lesson was posted on Tuesday, and I couldn't wait to get started. I wanted to stop in today and share the layout, that I created using the Impasto technique and the primary color, Yellow. Yellow is my favorite color, so I just couldn't resist using it as my primary color. I used a Lemon Yellow acrylic paint, several different Yellow patterned papers and I dug through my embellishments and chose coordinating Yellow pieces. Since the Elle's Studio heart wood veneers were not colored, I used a bit of the same acrylic paint, to add the Yellow to them. 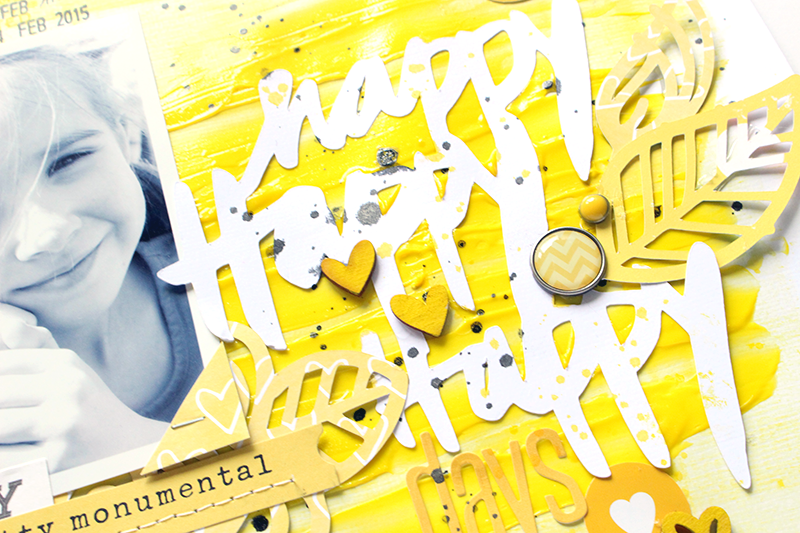 The title is from one of the cut files that Wilna provided for the class, and I also used some of the flower cut files from the Funky Florals set, that is available in The Cut Shoppe! I had so much fun putting this layout together, and I'm looking forward to the upcoming lessons! If you didn't get a chance to sign up, Studio Calico extended the class deadline, if you would like to check it out!